Pope Benedict XVI will visit St. Joseph's Seminary in Yonkers on the afternoon of April 19 as part of six-day trip to Washington and New York that will also take him to Ground Zero. He will meet with youth and seminarians at St. Joseph's. Pope John Paul II visited the seminary, known in the Catholic world as Dunwoodie, in 1995. "I have assured the Holy Father of a warm and prayerful welcome,"Cardinal Edward Egan said in a statement. "We all look forward to his visit with pleasure and anticipation." 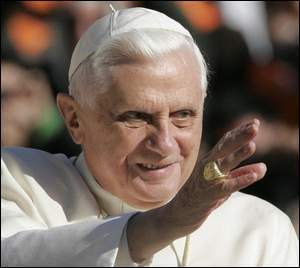 Benedict himself visited the seminary back in 1988, when he was still Cardinal Joseph Ratzinger. Comments on "In which the Pope drops in for a visit"